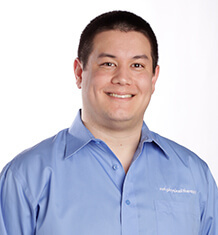 Eric graduated from Washington University School of Medicine in St. Louis with a Doctorate of Physical Therapy and joined MTI Physical Therapy’s Kirkland team in 2017. He is looking forward to continuing his training in Orthopedic Manual Therapy through the Ola Grimsby Institute’s Orthopedic Manual Therapy Residency program. Eric is passionate about helping his patients enhance movement and optimize function so that they can return to the activities they enjoy. Eric grew up in the Woodinville area and attended Woodinville High School. Through personal experiences with his own sports injuries, he discovered his passion for the extensive examination process physical therapists perform, which aided in his rehabilitation from various injuries. Eric continued his participation in athletics in college and went on to graduate from Western Washington University in 2014, earning a Bachelor of Science in Kinesiology and a minor in Chemistry. After living in St. Louis to physical therapy school for three years, Eric is excited to be back home in the Pacific Northwest to practice physical therapy. In his free time, Eric enjoys spending time outdoors playing sports, hiking in the Cascades, and rooting for local sports teams.